The song of the Open Road is a symphony in the Yukon because there is just so much to see. 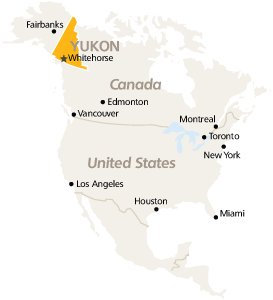 • Whitehorse is the gateway to Yukon adventures. • Whitehorse is just 2.5 hours from Vancouver, British Columbia by regular jet service. • You can also fly from Edmonton or Calgary to Whitehorse. • Yukon is right next door to Alaska, so you can easily visit both places on one trip. Yukon, the territory anchoring the northwest corner of Canada, right beside Alaska, is about the size of France with a population of just 33,000. With 4,850 km of road heading in all directions across our diverse environment, traffic jams aren’t much of a problem. Drive anywhere in the Yukon and you’ll find a whole new experience, unlike any you have had before.